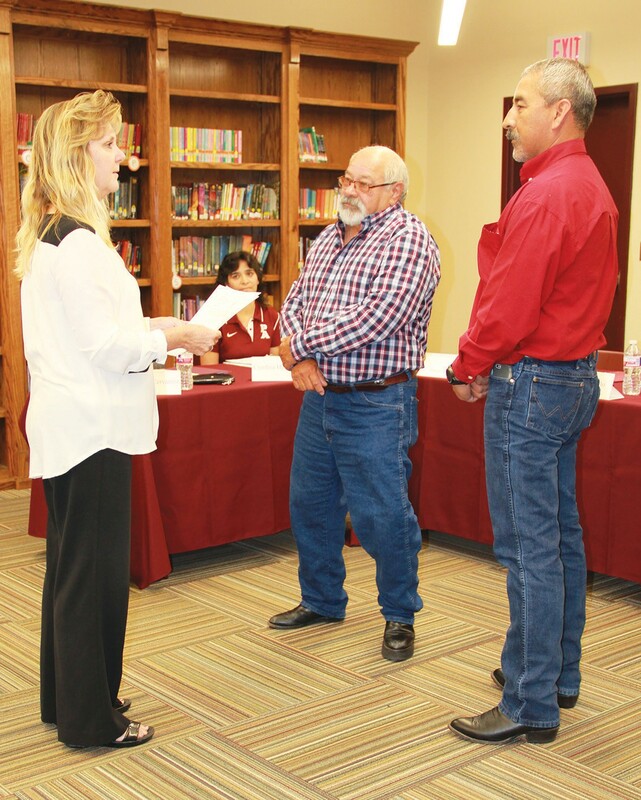 Suzanne Jenschke swears in returning school board member Louis Vasquez and new board member Diego Puente at the May 16 Poteet ISD School Board meeting. On May 16 at 7 p.m. the Poteet ISD Board of Trustees met for their regular monthly meeting. In attendance were Superintendent Andy Castillo, President Barbara Reyes, Vice President Henry Ortiz, Secretary David Herrera Jr., Louis Vasquez, Cynthia Hograves, Yvette Navarro and Jo Marie Cervantez. At the beginning of the meeting, Reyes certified the results of the school board election that took place. Vasquez was reelected for another 3 year term in Place 6. Herrera was outnumbered in votes by Diego Puente. Puente will now take Place 7 for a 3 year term.Both Puente and Vasquez were sworn in as school board members after a plaque was presented to Herrera in recognition of his years of service as a school board member. Herrera in turn thanked the board and those in attendance of the meeting and wished the school district much success. “At this time, I would like to thank David Herrera Jr. for his 8 years of service to Poteet ISD. In your years you have helped us to move forward. Thank you for your commitment to Poteet ISD and our kids,” said Superintendent Castillo. Castillo announced several awards nights would be taking place, as well as graduation. He encouraged all to attend the events. He also reminded board members about the upcoming leadership summit in San Antonio. Poteet ISD was also notified that they received the Highly Qualified Pre-Kindergarten Grant. They weren’t given an award amount at the time, however, this grant will help them continue to fund the curriculum for first-year students. Two top-ranking students from the junior high and high school campuses were featured in the Student Spotlight. Junior High Principal Destiny Barrera honored 8th grade students D’Andra Calhoun and Vivianna Gonzalez. Principal Debbie Akers recognized the senior class Salutatorian Julian Meyer and Valedictorian Clayton Akers. Both Akers and Meyer will be attending Texas A&M University in College Station, TX. The board minutes for the month of April were approved. There’s still construction taking place within the school district. Since construction hasn’t been completed, payment hasn’t been made to the construction company. The new school police station will be completed by the beginning of the new school year. 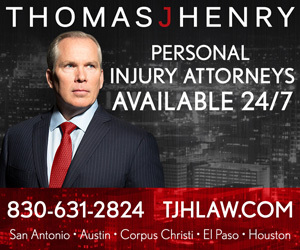 Attorneys are still working on the football field situation. Ag teacher Mr. Kennedy and Russell Rodriguez recently visited the new Ag facility in Pleasanton and Southside ISD in San Antonio. From those visits, they were able to come up with drawings and ideas to either create a new ag facility or renovate what they currently have at Poteet ISD. A new building, complete with new fixtures and animal pens would cost upwards of $830,000 dollars. Renovations on the current facility would cost close to a quarter of a million dollars. A few board members spoke up in agreement that it would be a while before the school district would be able to afford to put plans into action. Castillo then suggested a three year plan be put together to work towards getting a new ag facility and band hall. Dr. Salinas gave information about the ACE Summer Program. It’s free for all Poteet ISD students to attend and will begin June 6 and run through June 30. They will also be holding registration for students August 4-9 from 8 a.m. to 8 p.m. on Monday through Thursday. Friday’s registration day will take place from 8 a.m. to 6 p.m. They plan to stress the need for parents to fill out the reduced lunch applications and health information cards. Regardless of whether the student(s) qualify for the reduced lunch program or not, the school district still benefits by the number of applications they submit. They’re also looking at providing immunizations on-site during those registration days. The board members went into closed session and upon their return they ended the meeting with their announcement of who the board officers will be: President-Barbara Reyes; Vice President-Henry Ortiz; and Secretary-Louis Vasquez.